St Matt’s Church supports mission abroad and at home on a regular basis. We have three individual mission links, Pat Blanchard in Peru (CMS), Ruth Radley in South Sudan (CMS) and Steve and Diana Morris in South Africa (Sozo Foundation). We are regularly in touch with them and support them both in prayer and financially. Whenever they are in the UK they visit us to update us about their work. We have a church link with the Diocese of Geita in Tanzania and members of St Matt’s have visited the church, while the Tanzanian Christians have also visited us. In terms of world needs and disasters we support Tearfund on a regular basis with individual appeals when sudden acute needs arise. More locally, we have members involved with Life and Soul, a local youth charity working with schools and youth. More information on individual links is available here and on the church notice boards. Based in the shanty town areas in the south of Lima, Pat Blanchard is a CMS mission partner, working as a Deacon in the Anglican Diocese of Peru. 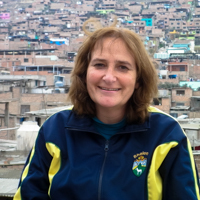 She has worked in Lima since 2000 in different roles, being ordained to the deaconate in 2006. Pat is currently working full time as deacon/coordinator of the Shalom project, which was started in 2003, and works amongst children and young people with disabilities – providing therapy and support to more than 90 children and their families. In 2008 the Shalom church congregation was started. Following a time of renting premises, a property was purchased and then rebuilt to develop this important and strategic community based ministry. Today Shalom has Peruvian physical, speech and language therapists, psychologists, pre-school teachers and other professionals who complement the services offered. Craft workshops provide practical skills, social orientation and some income for the young people and their families. State provision for therapies is very limited with many rehabilitation centres situated in distant hospitals and high priced and inaccessible transport inhibiting access. Shalom also helps to integrate those with disabilities into community life, break down barriers and discrimination and the church works closely with other agencies in the area to promote and develop activities. Pat is currently overseeing the continued development of the Shalom property and ministry – the therapies and activities it runs as well as the church that is based there. For further information, please contact Mary Wilson. As a church, our initial contact with Ruth was through working with her at the ‘Boulder Gang’ children’s group at the New Wine Summer Conference. 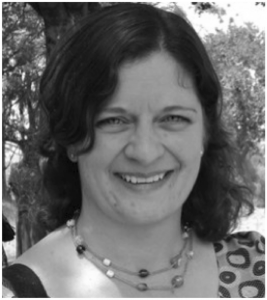 Ruth is now a CMS mission partner working in South Sudan with Across, a Christian NGO whose vision is the ‘Christ-centred transformation of South Sudanese communities’. She is working in the children’s ministry department. Over the years, Ruth had felt a deep compassion developing within her for children, both within England and around the world. She originally trained as a children’s nurse, working in Nottingham and latterly at a church in Canterbury as the Children’s Ministry Co-ordinator. This work further cemented her deep desire to see children treated fairly and justly – and to be able to take their rightful place in God’s kingdom. During her time in Canterbury, she also completed a diploma in Children’s Evangelism and Nurture from Cliff College, and more recently has completed a Masters Degree, also from Cliff College. Across views the strategic importance of working with children and young people in churches and other organisations as an integral part of its mission. Each department in Across looks at ways to integrate with other departments, seeking ways to incorporate children’s ministry into other (family and community) programmes. During her first term with Across, Ruth was asked to write a child protection policy and train its workers within this area. This has led to other similar opportunities for Ruth to share the need to protect children – training student teachers, Sunday school teachers and others as well. The needs of children in South Sudan can sometimes be overwhelming but it seems that at least half the South Sudanese Church is made up of children. This presents huge opportunities and many blessings for the church to embrace. Still emerging from many years of war, working towards elections and a referendum and with some areas still experiencing violence through tribal conflicts, South Sudan is grappling with some very difficult issues. Ruth’s blog can be found here. For further information, please contact Sarah Johnson. Steve and Diana started to work with the Sozo Foundation in Cape Town whilst they were still living in Essex, with Steve working for the Community Church in Chafford Hundred, taking youth mission trips out to South Africa. In 2013 whilst Steve was speaking at the New Wine Summer Conference, the congregation were moved to donate to the Sozo Foundation, and £30,000 was raised during his sermon, which later increased to £55,000 as the word spread! In January 2015 Steve and Diana, with their two young children, moved out to Vrygrond in Cape Town, to start working full time for the Foundation. Sozo’s mission is to transform an impoverished community by providing education, training, wellbeing and youth development. Steve is project managing their new Youth Cafe, whilst Diana’s role is more behind the scenes. Steve’s blog can be found here. For further information, please contact Carole Wicks. On the 3rd Sunday of each month we have a ‘Mission Prayer Breakfast’ in the Church Centre. Running from 8-9am we have a simple breakfast together and share news of – and pray for – our Mission links. We welcome newcomers to pray with us! Contact Mary Wilson or the church office for further details or do just come!